This is an absolutely amazing deal brought to you by the President of Grizzly. 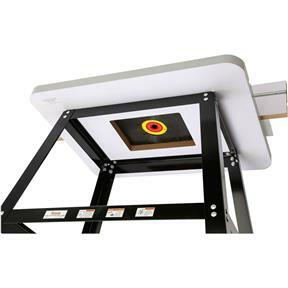 Just add your router and you have a large size platform for your woodworking projects. Table size is 31-7/8" wide x 24" deep. Very happy...works great. Added a shelf, feather boards, 4" DC hose and a mobile base. Bought based on price point. Was surprised by the quality. I had read where buyers were complaining about the flatness of the table? I received one with a flat table. I did up grade the insert with a aluminum insert, the one supplied is a plastic material. Wanted something more ridget. Plan on using a 3.25 hp router. Exactly what I was looking for and at a good price too. I really like my new router table. Most router tables are crazy expensive. This was perfect. It was pretty hard to get the holes drilled perfectly to attach router th the plate. In fact, I broke the corner of that place getting it done right. Other than that is was great. 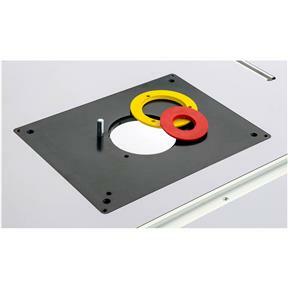 Universal mounting plate means drill your own holes. Which meant for me I need to order another mounting plate Because the first is a mess. It hard brittle plastic. The mounting plate is the only thing so far that I dont like about this table. 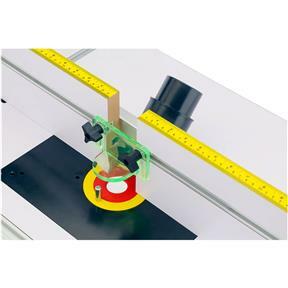 Maybe include some templates if the most common router mounting spots? Table is sturdy and heavy so it doesnt tip when doing larger heavier pieces. Could not get router monted to plate. Otherwise love the table. So far so good , arrived in a very timely manner and with no issues. Assembly was smooth and simple, I have only used it twice so far but very pleased with results. Happy woodworker. Easy to assemble. Works well with the milwaukee 5616-20 router. I'm still in the process of linking the dust collector and rigging all my hold downs and stops. For the money you can not lose! Easy to put together and fast. And very easy to use. The router table works well for my needs as a hobby woodworker. Good value for the price. My only criticism is that the plastic router mount is a little weak and can deflect during use. I had an issue with the top on my new router table. are still companies out there that care about their customers. I purchased this product from the winter sale catalog and have assembled it. It seems to be well made and was easy to put together. I have not had a chance to use it as I have had no need at this time. My only complaint would be some minor damage to the table top which occurred during shipping and which I repaired myself. ( I didn't want to go through the hassle of filing a shipping damage complaint and corresponding wait for a new top.) I think additional cardboard in the edge and better/more tape would have helped. 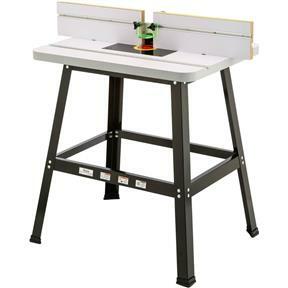 This is a very basic router table and allows for a great deal of your most common tasks to be done quickly and easily. I have seen what appeared to be the same table at other retailers for over double the price so grizzly was the obvious choice. It is a good, solid table. The T tracks are installed nicely and you will never wear out the aluminum angle the the fence attaches to. I added a couple of featherboards and started cutting and I am very happy with it, this table will serve me well for a very long time. At some point I will probably add a steel or aluminum adapter plate because the one that comes with the table is a weak point but I won't hold it against them. I think the router table is a good value for the price. Most features are included. I would have liked to see the T tracks on the front side of the fence a little lower so I could have used some shorter feather boards I have. Instead of trying to add more slots which I think would have weakened the fence too much, I'm using longer shop-made feather boards. The other reviews I read were critical of the router mounting plate. I found it acceptable but need to add more thread locking compound to the leveling screws which move due to vibration. Assembly was reasonable and mounting the router in the plate went well. One feature I like is the snap-in throat plates. I've used all the options. I added a power switch and a shop-made dust collection box that the router hangs in. Used with the dust port on the fence nearly all the dust and chips get collected. In summary I like the table and appreciate Grizzly's offerings in this price range. 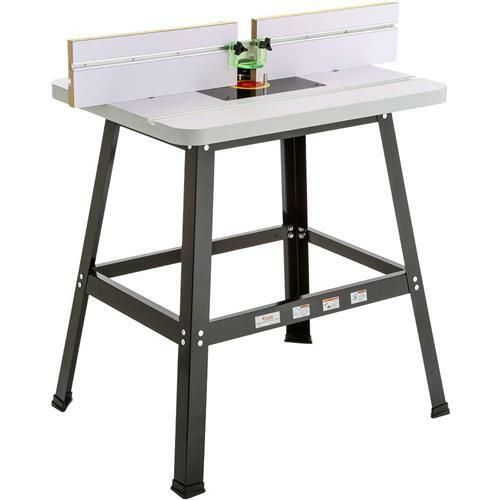 Considering any other router table this size with this amount of features would cost a minimum of twice the price, this is a pretty good deal. Unfortunately the one I got has an insert plate that is considerably bowed down in the middle, even without the weight of the router. So, be prepared to add another $50+ purchase to to the price of this to get a decent router plate, but that's still cheaper than any other router table on the market. Personally I was lucky to be able to get a scrap piece of 3/8" lexan from where I work, and used a pattern bit to cut a blank to match the one that came with the table. Besides the plate, everything else seems to be good quality. The fence is straight and easy to adjust, the table is flat and the dust collection works well. I've had this router table for a little over a month and used it quite a bit. I've made rail and stile cabinet doors as well as edge routing for another project. 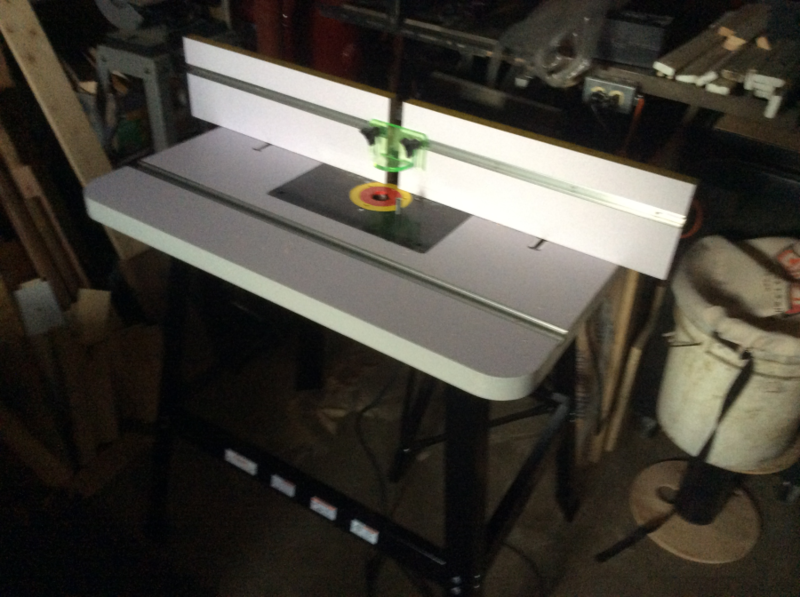 Overall, I am very happy with this router table especially considering the low cost. The only issue I have had is the set screws used to level the insert will go out of adjustment very quickly. This problem started out to be just a little annoying but they got worse over time. Eventually, I had to re-adjust them every few passes. After my last project I applied some locktite to each of the screws. Hopefully that will solve the problem. Other than that, it has been a great table for the money. Have not used it yet, but it seems like a very good product. The router insert is not the high quality associated with Grizzly products, otherwise I would have given it 5 stars. I purchased this as a Christmas gift for my husband. The only issue I have is the lengthy delay in shipping it to me! I was very stressed out that his gift wouldn't be under the tree for him. 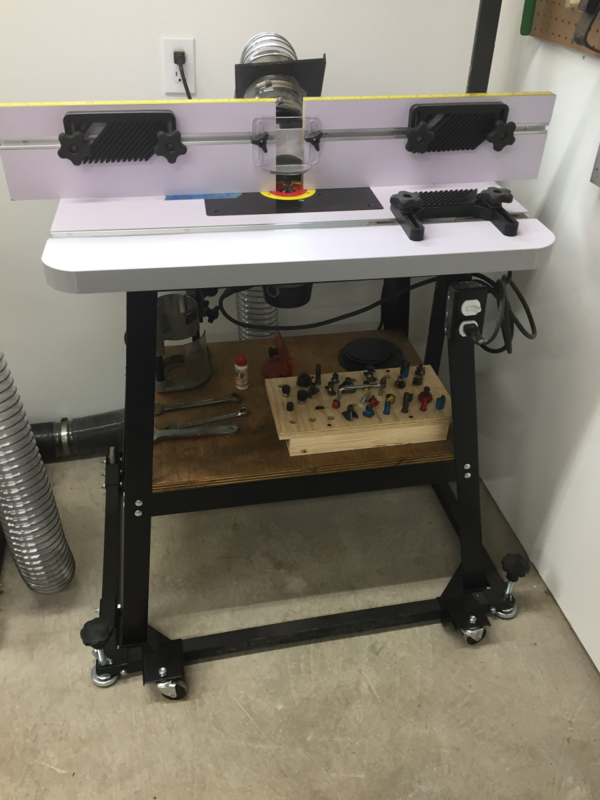 I was impressed with this router table and the customer service replacing broken parts during shipping it was a pleasure dealing with a company that backs up there products with no questions, received replacement parts in a short time and it is up and functional again wonderful service. 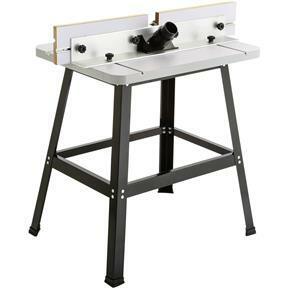 I had bought this router table for my son for Christmas, when it arrived by U.P.S. the box was damaged. Upon opening the box the table top was the only thing damaged on the inside of the box. I took pictures of the damage and sent them to Grizzly. Several days later the Grizzly staff contacted me and advised me that a new router table top would be on the way to replace the damaged one. The new router table top did arrive undamaged, I then transferred the t track from the damaged table top to the replacement table top. I will be a returning customer for future items. The table itself, with the t-track and fence are awesome... The router plate, well, it leaves a bit to be desired... Following some tips I read online, I was able to get it to be firm, but it does flex a lot and the set screws need some glue or wax to keep from adjusting themselves... But everything else, including the stand - perfect! It was difficult for me to center the holes I had to drill to mount my router. Wish it had pre-drilled holes or at least markings for the holes. 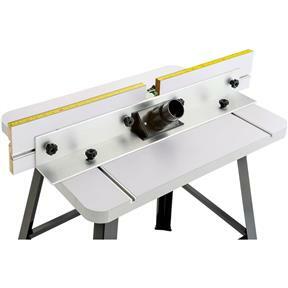 I bought this to replace an old table top router table and this will make working on router projects so much easier. Well worth the investment. For both the hobbist and light craftsman. It is heavy enough not to walk around when in use. Very happy with what I received. some of these are very expensive and this one is very practical. I have an older Milwaukee, so I needed the plain insert. You can even add another high end adjustment insert if you wanted. It seems these are pretty standard. But my old Milwaukee does not have that feature anyway. replaced my sears table with this did not know what I was missing. 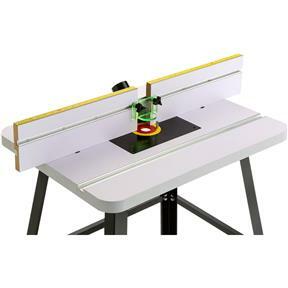 I got this to upgrade my router table and it is excelllent!!! I would highly recommend this table an buy again the fence and rails are great. Very solid table. Went together quickly and easily. Very economically priced for quality of construction. It could use measurements or graduated markings on insert or table top to adjust fence parallel. I have used the router table for several projects now. 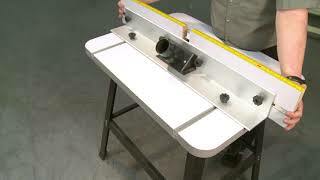 The router plate is hard to keep level with table top due to the plastic bending. Needs to be made from metal. Nice table for the money (on sale price), the overall height is a little short. Decent router table for the money. Does what I need to do. Would rather it wasn't pressed wood. This router table does everything I expected and more. Setup was easy and it works great. I bought this a month ago an set it up to help making Christmas gifts. The table is great and the high fence allows doing routing operations to the ends of wide boards standing up. I like the table size to allow better control when routing cabinet raised panels. The only negative is that the router mount plate gives slightly when putting allot of downward pressure on the work piece. sometimes you have to jiggle the work piece for it to transition back to the solid table. It was a gift and they use it regularly. Came very quickly. incredible. It was perfectly square to the table. I like the one piece fence support. Makes adjustment much easier. of various accessories. All in all a great value for the price, and good support from the company.